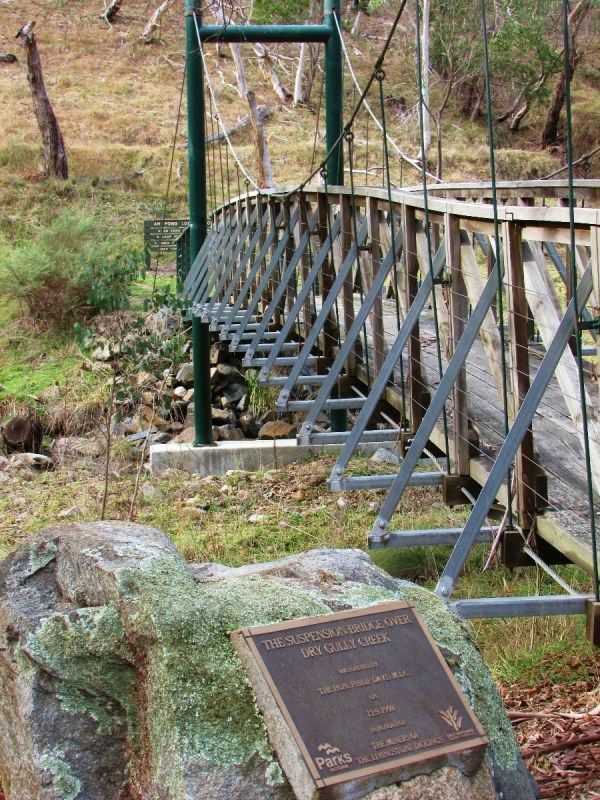 Suspension bridge over Dry Gully Creek was erected in honour of the mininers of the Livingstone Diggings. In 1851 Reverend W B Clark, a noted geologist, reported that he had found evidence of gold in quantities that would make the mining of it economically feasible. Alluvial deposits of gold were found in tributaries of the Livingstone Creek, and by the end of 1854, over 200 men were camped along its banks digging for gold, most of it being found within a meter or so of the surface. The Oriental Claims area alone produced an estimated 58,000 ounces of gold. 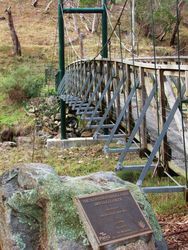 By 1855, most of the shallow alluvial gold had been mined and the process of hydro-sluicing was introduced to the Omeo goldfields. In an operation that took nine months to complete a water race was constructed along the mountain slopes for a distance of almost nineteen kilometers. Giant flumes crossed gullies and ravines with the water arriving at about 190 feet above the creek and the alluvial deposits. Races were cut from almost every stream that could supply water. In the process, water blasted away the alluvial gold-containing gravel and the gravel slush was channeled into rows of wooden sluice boxes and the gold ore collected. At a point when alluvial deposits were diminishing, a miner walked into E J Johnston's general store, to cash in some gold. Johnston paid the man his cash, but as he weighted the gold, he noticed something stuck to the pieces of ore. It was quartz. It heralded the meaning of reef mining. And a new boom. 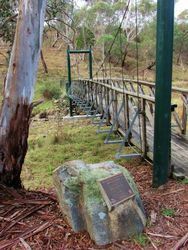 The first venture into quartz mining was at the Dry Gully field with the first battery being established at Mountain Creek. People came from all over the district to see a local identity, Miss Rogers, smash a large bottle of champagne over the wheel as it started up, and christen it the Mountain Maid. Bullock teams hauled multi-headed batteries up the mountains and across the alps to work the new found reefs. Smile of Fortune, Rip Van Winkel, Happy Go Lucky, The Joker, and Inexhaustable were some of the names given to the many reef mines that opened up. THE HON. 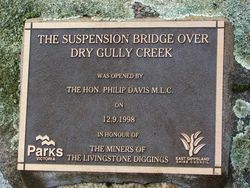 PHILLIP DAVIS M.L.C.